Chapter 8 The heavenly New Jerusalem is an actual place. “만일 거기에 있을 곳이 없다면 내가 너희에게 이렇게 말하겠느냐 (공동번역, 요 14장 2절)” 하신 말씀을 보아서도 하늘에 실물인 새 예루살렘이 있다는 것은 도무지 부인할 수 없다. From the verse, “If that were not so, would I have told you (John 14:2),” one cannot deny that there is New Jerusalem in heaven that is an actual place. 사도 바울은 하늘의 새 예루살렘에 대하여 광대함과 천만천사와 하늘에 장자 총회와 온전케된 의인들의 영들과 하나님의 보좌와 어린 양의 보좌 등등의 어머어마한 광경을 보고 다음과 같이 기록하였다. (공동번역 히 12장 22-24절) “그러나 여러분이 와 있는 곳은 시온산이고 살아계신 하나님의 도성이며 하늘의 예루살렘입니다. 거기에는 수많은 천사들이 있고, 잔치가 벌어져 있고 또 하늘에 등록된 장자들의 교회가 있고 만민의 심판자이신 하나님이 계시고 완전히 올바른 사람들의 영혼이 있습니다. 그리고 새로운 계약의 중재자이신 예수가 계시고 아벨의 피보다도 더 큰 힘을 발휘하는 속죄의 피가 있습니다” 하였다. 앞서 기록한 말씀은 분명한 사실을 편지로 기록한 것이다. 그리고 예수 그리스도께서도 자기 피를 가지고 단번에 들어가셨다고 하였다. The previous verse is a clear fact that is written in a letter. And it records that Jesus Christ also has entered by his own blood. (히 9장 11-12절) “그리스도께서 장래 좋은 일의 대제사장으로 오사 손으로 짓지 아니한 곧 이 창조에 속하지 하니한 더 크고 온전한 장막으로 말미암아 염소와 송아지의 피로 아니하고 오직 자기 피로 영원한 속죄를 이루사 단번에 성소에 들어가셨느니라” 하였다. 유대나라에 세워진 지상의 성전은 사람의 눈으로 볼 수 있고 사람의 손으로 만져볼 수도 있다. 그러나 하늘의 성소는 이세상의 속된 인간의 눈으로 볼 수도 없고 부정한 손으로는 만져볼 수도 없는 거룩한 성전이기 때문에 있다, 없다 상상조차도 못할 것이다. The earthly temple in the Jewish nation is visible and tangible. However, the heavenly sanctuary is a holy place that cannot be seen by the eyes of the worldly-minded man nor touched by unclean hands so one cannot even imagine whether it exists or not. 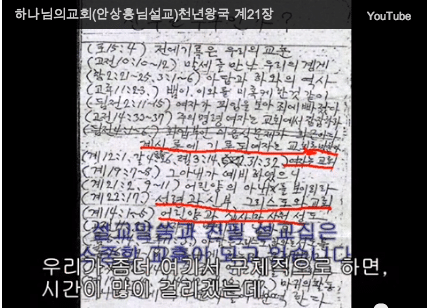 요한계시록 21장 1-4절의 기록한 새 예루살렘 즉 하나님의 장막이 사람들과 함께 있으매 한 이 장막도 사람이 아닌 신령적 건물입니다. 그러면 왜 우리교회에서 주장하는 바 성도들이 교회요 14만 4천 성도가 새 예루살렘이라고 하였는가? 그 이유는 모든 교회가 생각하기를 건물이 교회요 새 예루살렘이라고 하기 때문에 나는 그것을 좀더 확실하게 알리기 위하여 성도가 모이면 그곳이 교회요 14만 4천이 들어갈 곳이 새 예루살렘이라고 분명하게 증거한 것이다. Revelation 21:1-4 records that the New Jerusalem or tabernacle of God is with the people, and this tabernacle is not a person but a divine building. So why are we claiming that saints are the church and 144,000 saints are the New Jerusalem? Because every church thinks that a building is church or New Jerusalem but I want to make it clear that church is where saints are gathered and the New Jerusalem is where 144,000 saints will enter. 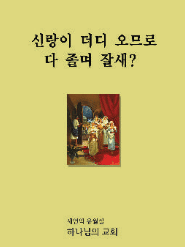 주께서 베푸신 이 장막은 지상사업 마치고 천년이 지난 후에 하늘에서 내려올 것을 보이신것이다. This tabernacle built by the Lord will come down from heaven after one thousand years after the completion of earthly missions. Hebrews 9: 11-12 …it does refers to the church of Christ ‘Zion’ ..and yesterday I went there because one of my friend was about to baptized and when I had a chance I was looking at the pictures that was hanging at the wall. And I saw how they baptized after that they write your name in the book of life. II am confused . All theteachings I could understand but I just can’t accept the Heavenly Mother and Ahn Sang Hongnim ..They even pray in his name..